Our Border IVR solution can integrate fully with your back office system, offering a secure, bespoke, customer-friendly service. Ensuring PCI compliance throughout your contact centre and business when processing card payments is challenging. It can be virtually impossible to secure every system, from call recording through to agent activity, network security and data backups. Our platform is recommended by international payment gateways and PCI QSAs, delivered by trained, experienced industry professionals. We will work with you and your security specialists to implement a solution that meets your business requirements. 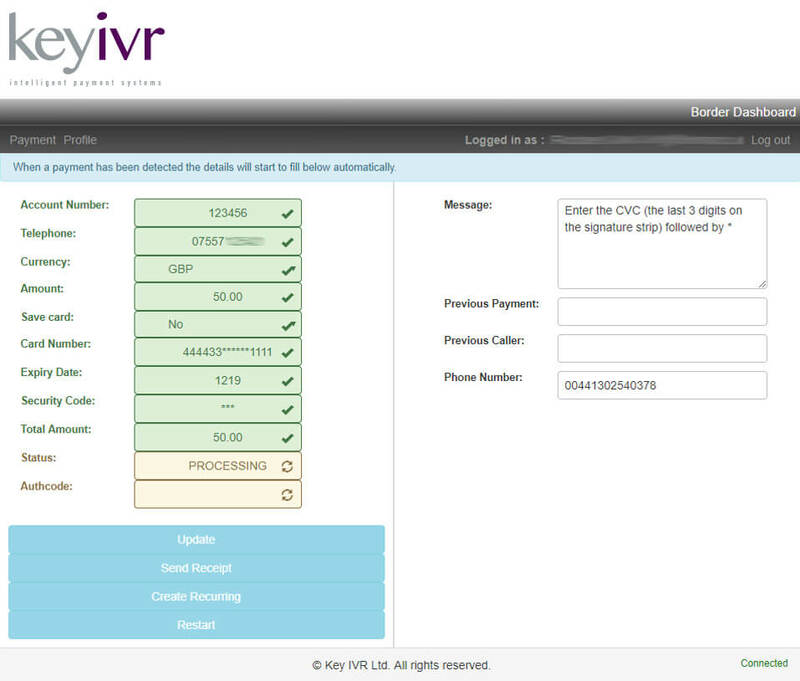 Key IVR’s Border platform for Call Centre Card Payments is an intrinsic part of our payment suite, and is helping call centres reduce their costs of PCI Data Security Standard (PCI-DSS) compliance, even to the point of making a business compliant that would be impossible without the service. We’d be happy to show you our Border solution in action with a one-to-one on-screen demonstration from a Border expert. Tokenise a customer's card and they will only have to provide card details once, saving them time on regular payments and purchases. Card details are not stored anywhere outside the issuing card company. All tokens will have a dedicated reference for every individual customer. E.g. Policy number, customer number, customer name, phone number, etc. Offer your customers a Recurring Payment Plan with a range of payment frequencies, such as weekly, fortnightly, monthly and more. If required, a Recurring Plan/CPA (Continuous Payment Authority) can be created by processing £1 that will not be taken on the customer's account. Using a Recurring Payment Plan instead of a Direct Debit allows you to re-take failed payments, restarting the plan and avoids your customers incurring expensive Failed Direct Debit charges. This method is recommended by the FCA, as debt isn't added onto customers paying off existing debt. Validate your customer transactions and avoid matching every transaction and investigating human errors. You'll have the option to supply customer records or a list of outstanding payments so transactions can be validated as a customer makes a payment. Our solutions are compatible with many different APIs, allowing integration with hundreds of different platforms. If necessary, a bespoke API can be developed to work seamlessly with your business systems.